The above info came from Meifong Cho, and was edited by yours truly (contact me). 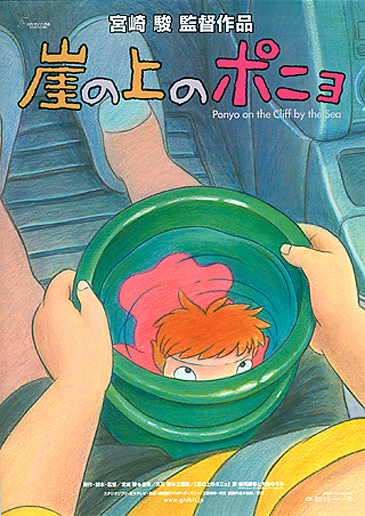 A five year old boy named Sosuke finds a goldfish who he names Ponyo and decides to take care of her. However, what he doesn't know is that Ponyo is a magical fish who wants to give up her underwater life to live with humans, and wants to become a human herself, which awakens an ancient spell and causes an imbalance, putting the world in danger. In this new fantasy film by Hayao Miyazaki, Ponyo is a fish girl who lives in the sea with her family. However Ponyo has a strong curiosity for the surface world and tries to explore it against her family's will. She meets and befriends a human boy named Sosuke. Ponyo also gains the ability to gain human form. However, this causes a major imbalance in nature, placing the entire world in danger! Now Ponyo and her friends embark on an epic adventure to save the world and completely fulfill her dreams of being human. The above description came from Meifong Cho, and was edited by yours truly (contact me).